MICHAEL BLAIR is the Founder and President of Ninety10Sports that focuses on developing athletes and coaches through rhythm, harmony and balance. Blair, as he goes by, is a former NFL Running Back who played for the Green Bay Packers, Cincinnati Bengals, New Orleans Saints, and the Kansas City Chiefs. He also played for the National Football League in Europe and the Extreme Football League and finished his career in the Arena Football League. Blair holds a Bachelor of Science degree from Ball State University. 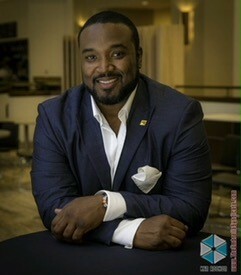 After completion of his professional football career, Blair began his next chapter and founded Ninety10Sports to focus on providing instruction through cerebral development to student athletes, coaching staff, and now along with business and industry leaders who desire to aim higher to reach their goals in life both on and off the playing field. He is also a member of the Jamaican Bob Sled team! Blair is a sought after motivational speaker, trainer and coach who teaches others his executive functioning skills which include; Time Management, Daily/Weekly Planning, and Organizational Skills. As with most activities worth pursuing, Blair has learned and understands that any game in life, or athletics, is 90% mental and 10% physical. If you want to transform the lives within your organization through personal development, let Blair share his fundamentals of leadership and success with your sports team or management team at your next event.